President Donald Trump waves to the crowd after speaking at a campaign rally in Duluth, Minnesota, June 20, 2018. 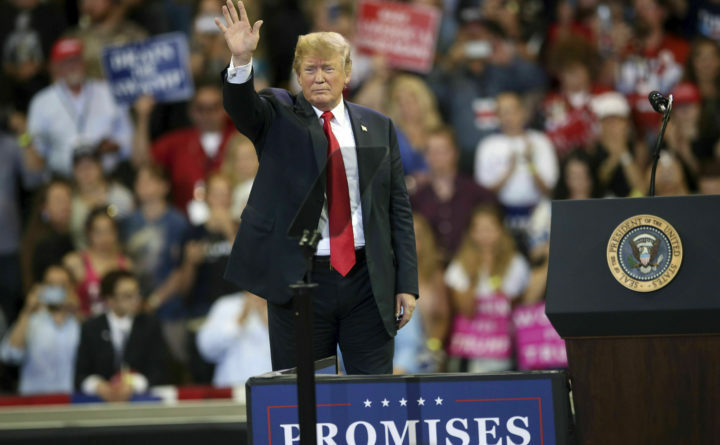 WASHINGTON — President Donald Trump’s re-election campaign raised more than $30 million in the first three months of the year, according to a campaign official, far outpacing each of the top Democratic contenders who seek to oust him from office. During a donor retreat in Palm Beach, Florida, last month, Trump’s re-election effort was slated to bring in at least $7 million over the course of a weekend, a Republican Party official said. The official, who spoke on the condition of anonymity to discuss internal fundraising figures, also said Trump’s re-election bid has had raised more than $1 million online within a 24-hour span multiple times this year. Trump’s State of the Union speech, and other days when the president highlighted border security issues, brought in loads of online donations from small-dollar donors, the official said. Sen. Bernie Sanders, I-Vermont, led a growing field in the Democratic primary race in the first quarter, raising more than $18 million. Sen. Kamala Harris, D-California, raised about $12 million, and former Texas congressman Beto O’Rourke raised more than $9 million — including more than $6.1 million in the first 24 hours after announcing his bid.